Perfect congress apartment in the center of Cannes. Newly renovated apartment in the centre of Cannes, in Le Suquet (the old town), just a two minutes from Vieux Port (the old port). The apartment is situated in one of the oldest houses in Cannes and both the apartment and the building was completely renovated on 2016. You have two bedrooms. First bedroom with a double bed and window to the street and a second bedroom furnished with two single beds. Large closets in both bedrooms. The kitchen is fully equipped with all you may need during your stay. Bathroom with shower and separate WC. And of course wifi and air conditioning. 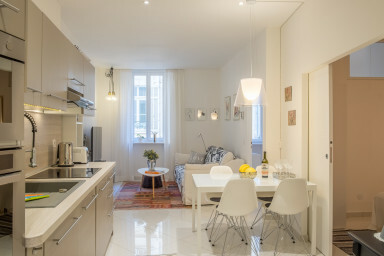 The apartment is located on Rue Meynadier, the former main street of Cannes, where the street reaches Le Suquet. Near the apartment you have some of the best restaurants in Cannes, nightlife, the food market Marché Forville and the Vieux Port with all the classic yachts. If you are in Cannes for a congress you will be very close to the Palais des Festivals and if you are in Cannes for holiday you are just 5 minutes from the beach. You will also be just a few minutes from the jet-set favorite La Croisette. – Restaurants: just outside the door. The apartment was great! Everything is new, tastefully furnished. Excellent coffee machine We have been in many places in Cannes, this apartment is the best. Anders and Marina are great hosts! Jag är väldigt nöjd med den fina servicen rörande transfer, check in och check out. Lägenheten upplevs som trevlig och fräsch och läget i fantastiskt. Stort tack för detta år och jag ser fram emot att ses även nästkommande år. very clean, suprisingly quiet yet central location - lovely stay during the hectic film market!